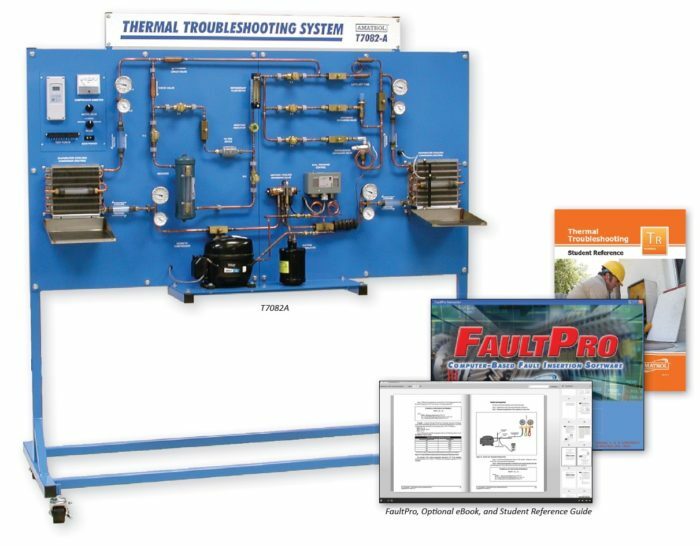 Amatrol’s Air Conditioning / Heat Pump Troubleshooting Learning System (T7082A) teaches valuable HVAC troubleshooting skills on a hands-on learning system that performs heat pump, air conditioning and refrigeration operation. The T7082A utilizes FaultPro, the industry’s only electronic troubleshooting system, to provide a hands-on experience for identifying faults such as blockages, leakage, and refrigerant overcharging and undercharging. Thermal systems play a key role in industrial, commercial and residential applications to provide heating and cooling of spaces and processes. This system is ideal for training HVAC technicians and installers. The T7082A System consists of a mobile workstation, compressor, pressure control system, refrigeration circuit, instrumentation set, temperature control system, blower control system, and much more! These components will provide hands-on experience for operating, adjusting, and troubleshooting air conditioning / heat pump systems in real-world, on-the-job applications. Learners will gain this technical knowledge by studying major topic areas like compressors, condensers, metering devices, evaporators, temperature and pressure control devices, and reversing valves. Amatrol’s FaultPro allows learners to insert faults as they go through the curriculum as part of the learning process. Additionally, instructors can instantly set faults to test and track a learner’s troubleshooting abilities. The T7082A features twenty-four faults in areas like electrical, refrigerant flow, and component adjustment. Some specific troubleshooting skills include: testing for a blockage; testing a blower; troubleshooting insufficient heating; and troubleshooting system cuts-out. FaultPro features online control of the troubleshooting activity through menu-driven screens, making it easy to set up and perform troubleshooting exercises for both practice and testing sessions. The T7082A features a variety of industrial components like flow meters, expansion valves, pressure/temperature gauges, evaporators, reversing valves, and many more! Learners will use these components to practice hands-on, skill-building tasks such as determining the amount of subcooling in a mechanical refrigeration system, setting the pressures on a dual-pressure control device, using a gauge manifold to measure thermal system pressure, testing a thermostatic expansion valve, and testing a compressor. The T7082A includes world-class heating and cooling troubleshooting curriculum that covers major topics areas like heat transfer, dual-pressure devices, filter/dryers and moisture indicators, refrigerants, and an array of troubleshooting topics. Specifically, learners will study concepts including: how to calculate a conduction heat transfer rate; how mass flow rate is calculated; the function of a sight glass/moisture indicator; how to test an automatic expansion valve; and how to troubleshoot insufficient cooling. In addition to the included printed curriculum, Amatrol also offers this course in an online eBook format. Amatrol’s eBooks provide easy, quick navigation and searchable course content in an online, computer-based format. The Environmental Applications Learning System (T7083) adds to the T7082A to teach heating and cooling applications. The T7083 models the characteristics of a living structure with outside environmental effects, such as sun or humidity, and internal design characteristics such as insulation, lighting, and ceiling fans. A sample copy of the Thermal Troubleshooting Student Reference Guide is also included with the system for your evaluation. Sourced from the system’s curriculum, the Student Reference Guide takes the entire series’ technical content contained in the learning objectives and combines them into one perfectly-bound book. Student Reference Guides supplement this course by providing a condensed, inexpensive reference tool that learners will find invaluable once they finish their training making it the perfect course takeaway.